We had the good fortune to attend another baseball game here Monday evening. It was cool, unlike the heat we now endure, and as magical as ever. 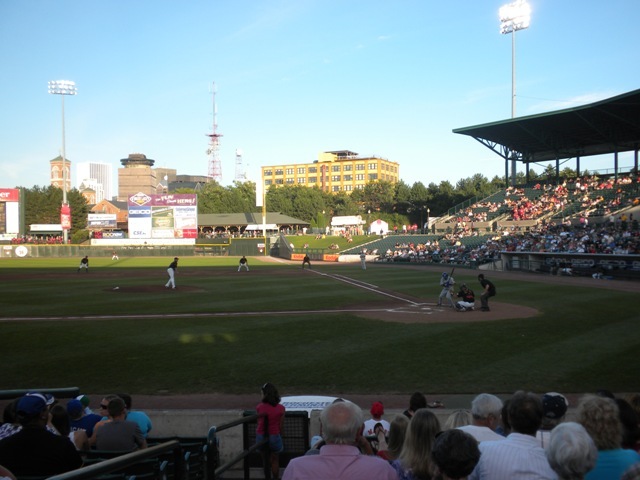 The Rochester Red Wings (AAA) beat the Norfolk Tide 5-2, and evening in the city in the stadium was, as always, sublime. As the sun slipped away, the city lit up, and the eternal pairing of the timeless Eden of green grass and batted ball, and the temporal urbanity of our actual surroundings made itself powerfully felt. Which got me to thinking. There are a few things that I believe are key to understanding any city. How the blocks of our city are formed for example, and how our houses are arranged on those blocks. Where we work and shop. How dense we are, or aren’t. How we move around. Where we get our water, and dump our refuse. But certainly one element essential to understanding any American city is understanding its baseball narratives. 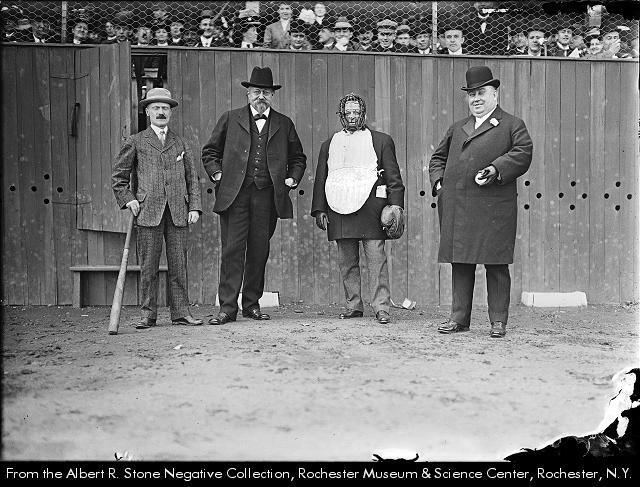 So I decided to investigate baseball in Rochester, to see if our city could really measure up. I was in for a surprise. Bay Street Ball Grounds, 1919. 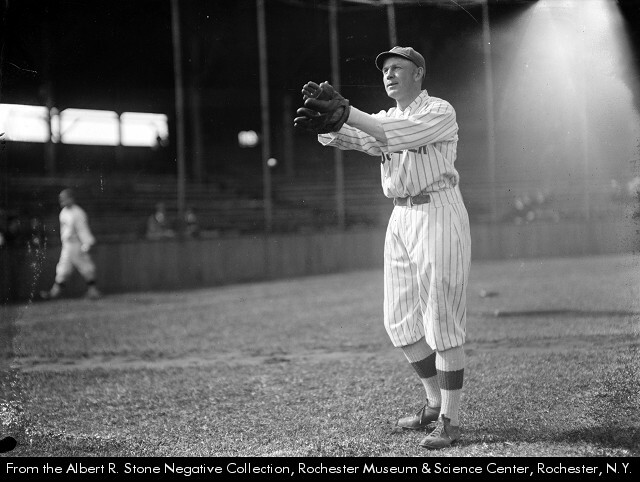 Rochester is home to the oldest minor league franchise in the history of professional sports, dating back to 1877. They joined the International League (they are still in the International League) in 1885. Yikes. In 1907, the Broncos opened their season at the Bay Street Ball Grounds. 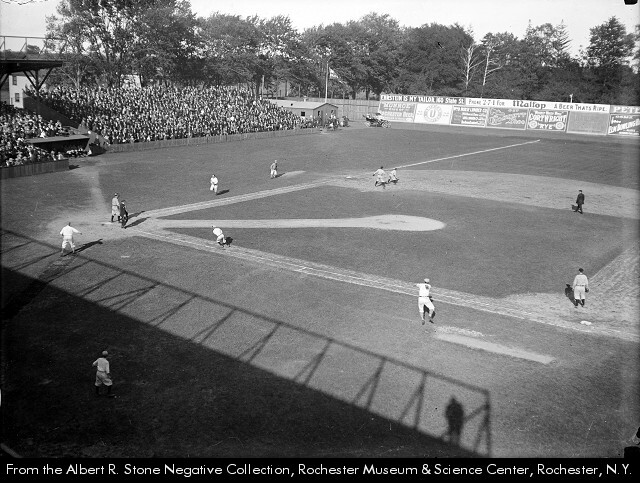 The following season they were the Hustlers, then the Colts in 1921, the Tribe from 1922 to 1928, and finally the Red Wings starting in 1929, when they abandoned Bay Street for Red Wing Stadium, which would later become know as Silver Stadium. 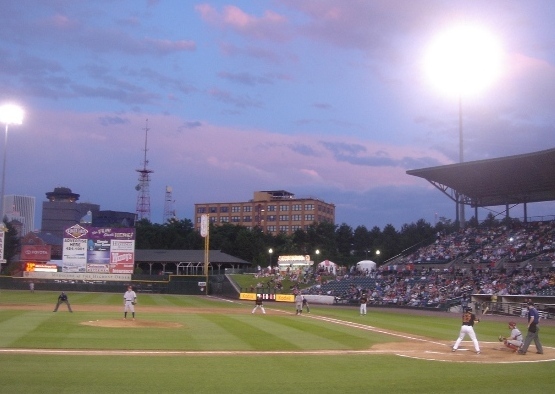 They played there until 1996, when the current stadium, Frontier Field, took over. But I am getting ahead of myself. Bay Street near Webster Avenue in our city, where the ballyard was to be found, was in the sticks in 1907. Very near the edge of the city, most of the surrounding land was fields. Lots were being platted at a pretty fast clip, but not much had been built. 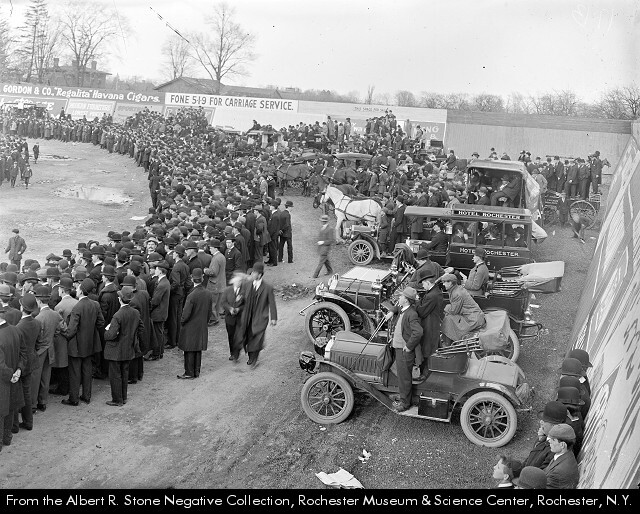 Take a look at opening day in 1909. It turns out that our man Mr. Stone spent a great deal of time at the ballpark, thankfully. Note the folks in the trees, above the third base grandstands. Again, opening day in 1909. In those days, the place was known simply as Baseball Park. 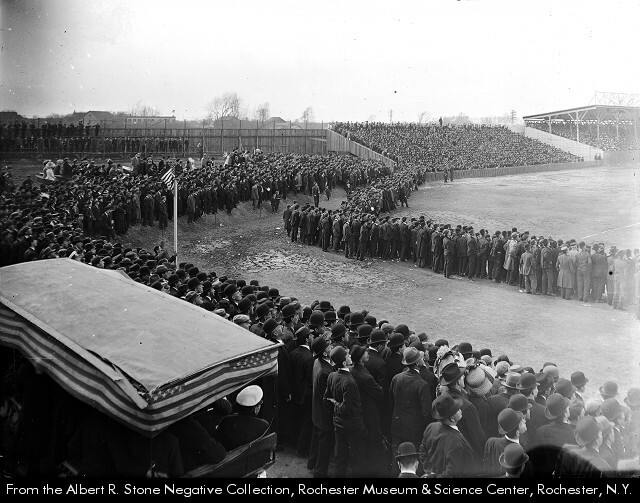 Opening day in 1909 drew 13,000 fans. Not bad. And even though the left field fence urges us to “Fone 519 for carriage service,” cars and parking in those days were becoming more and more important. 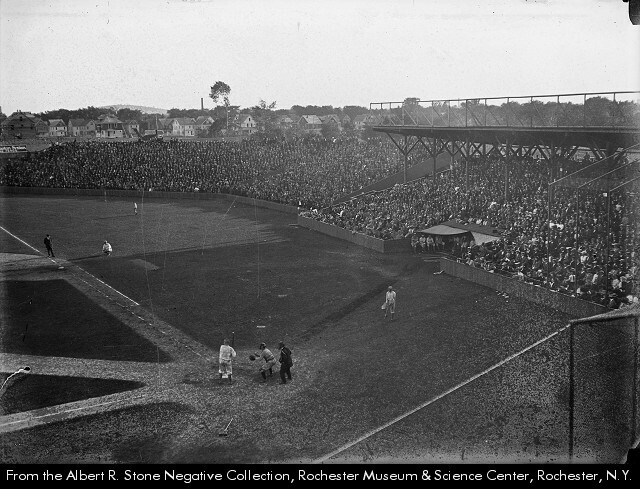 Here’s opening day in 1910. Baseball played an important role in this city’s life. 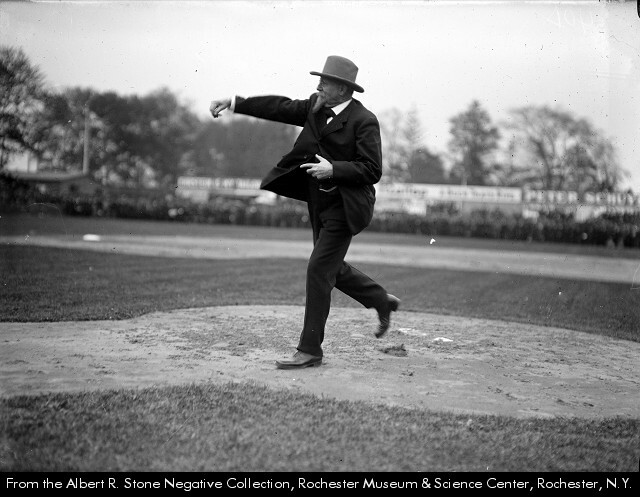 Here’s Mayor Edgerton throwing out the first pitch in 1910. The Mayor was quite a regular at Baseball Park. I love the peepholes drilled into the fence. The guy on the left is Charlie Chapin, owner of the Hustlers. 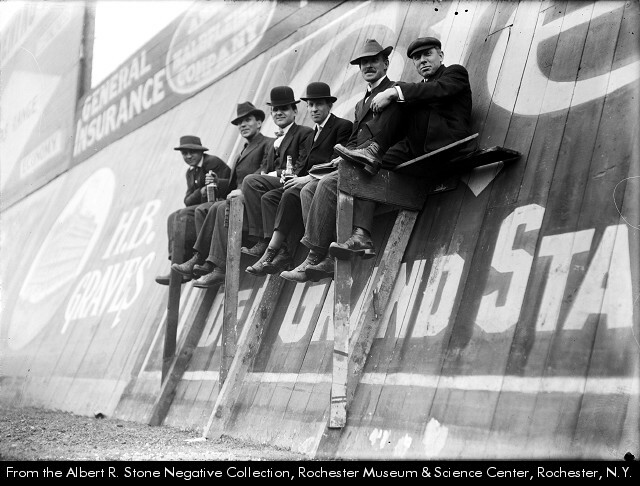 Here’s the Rochester Hustlers playing Newark, again in 1910. This view gives you a good sense of the Park and its urban context. Well, kind of urban. Mr. Stone got around the Park during this game – here’s a view from the first base side, again giving you a good sense of the surroundings. 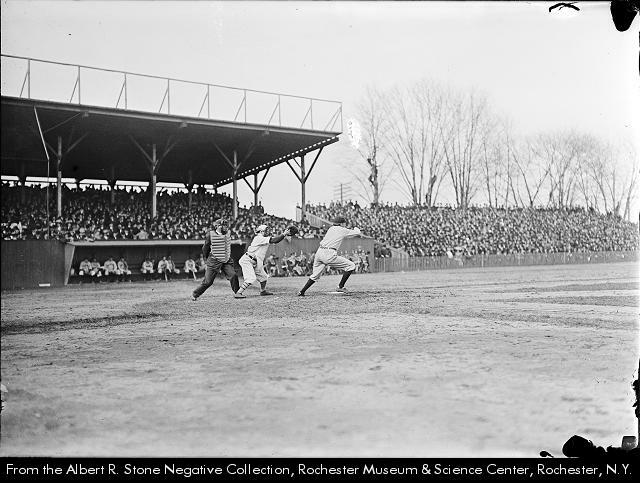 Mr. Stone caught the action in this one – the first base coach leaps into the air as a run heads to the plate. Summer in the city includes hot days, like our days this week here. But baseball goes on. 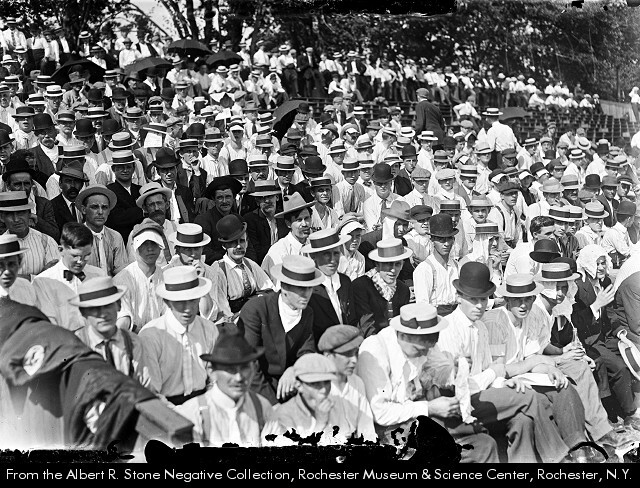 Check out this crowd on a very warm day in 1911. Hats and ties and long sleeve shirts and even coats. Ugh. Not a soul in a tee-shirt and shorts enjoying a cold one. 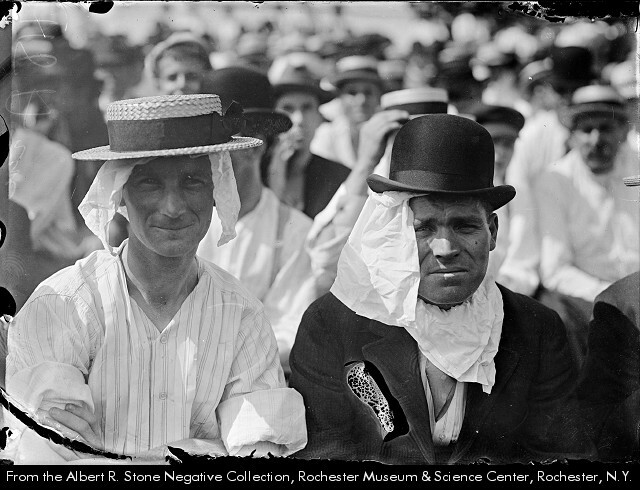 See that guy in the lower right with a handkerchief under his hat? Check him out, seen here with his pal. Out in left field the wall was battered – it sloped. And here are six guys who understood how to capitalize on that fact, in 1912. One of the true joys of baseball in the city, once upon a time, was how the field and the park adjusted itself to its locale in a kind of inventive, circumstantial and provisional fashion, thus rooting it in time and place. As I thought about baseball and our city, we took a trip out to Bay and Webster to see if any trace of the park remained. 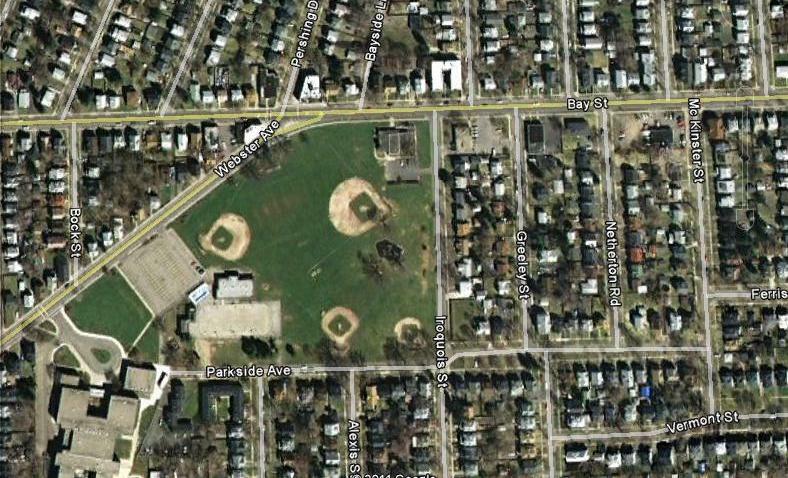 At that intersection is a large park, and I was sure that Baseball Park had once been positioned there. Wrong. Further research led me to this 1918 plat map for that part of our city. 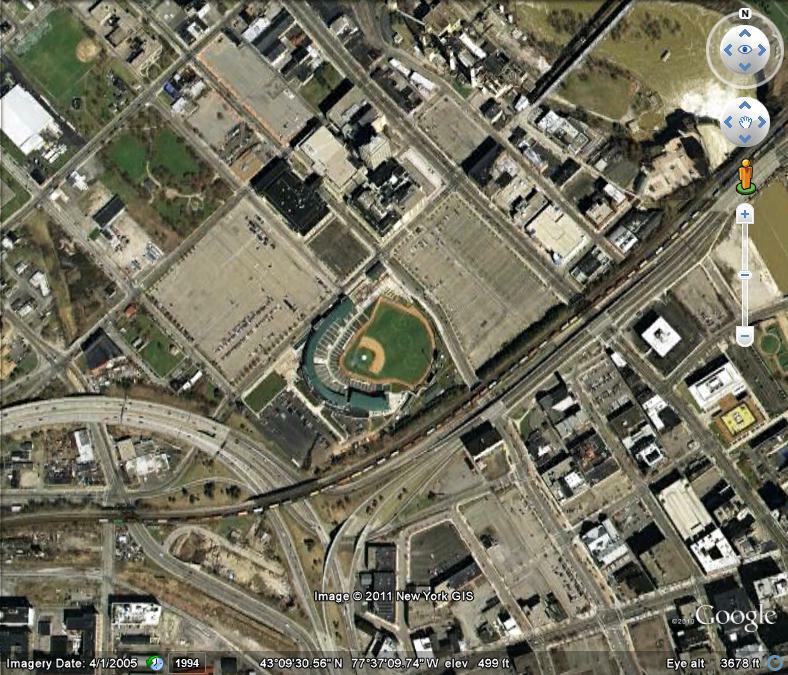 Take a look at where the ballyard was actually located. Note that all the building lots had been platted, but in 1918, very few had been built upon. The city was moving out to swallow Baseball Park. Gone. As in totally, completely gone. But before baseball moved away from Bay and Webster, and to underscore that the place was a robust part of our urban life, we find a few superstars in attendance. Yes, under that mask and padding is none other than George Eastman. 1917. 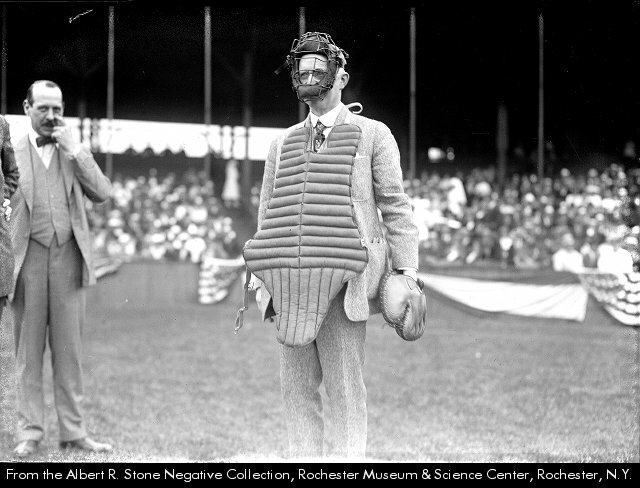 A couple of years later, in 1921, this guy showed up at the park for an exhibition game. 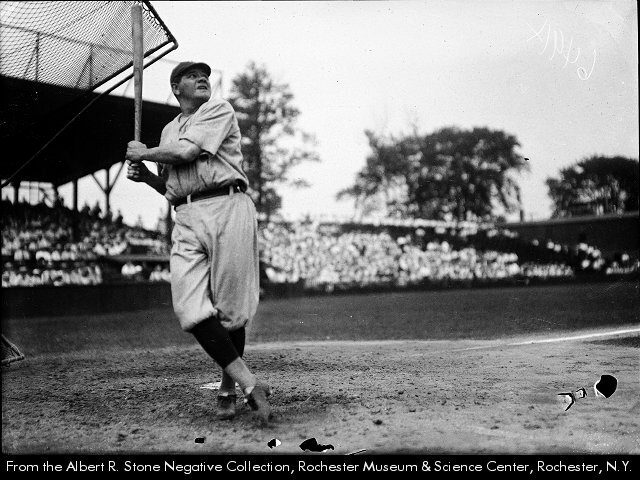 History doesn’t tell us where Babe’s swat landed, unlike that famous home run at Wrigley, but he must have really smacked it. In 1928, the ball club played its last season at Baseball Park. Why? Not enough parking? Too much adjacent development? Not enough seats for fans? In 1929 the club opened its season in Red Wing Stadium, which ultimately was named Silver Stadium in the 1960s, after Morrie Silver, who was president of the club in those days. This early image by Mr. Stone in 1930 illustrates yet another wonderful ball park, knitted and folded into the fabric of the city. By the late 90s, this stadium too was razed. Its location, on Norton in the middle of the city, had at least two major liabilities: not near the expressways, and not enough parking. Once again the car assassinates the city. And so we return to Frontier Field, conveniently located near the on and off ramps, and surrounded by a sea of parking. Well, almost everything downtown is surrounded by a sea of parking. 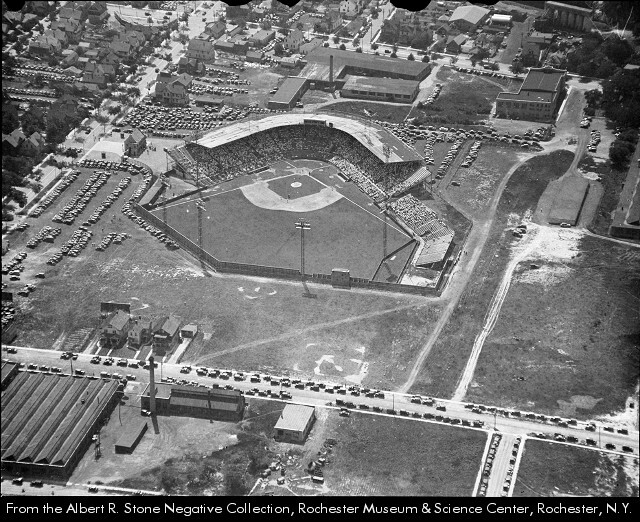 And so the story of baseball in Rochester is a perfect metaphor for the life of the city itself. 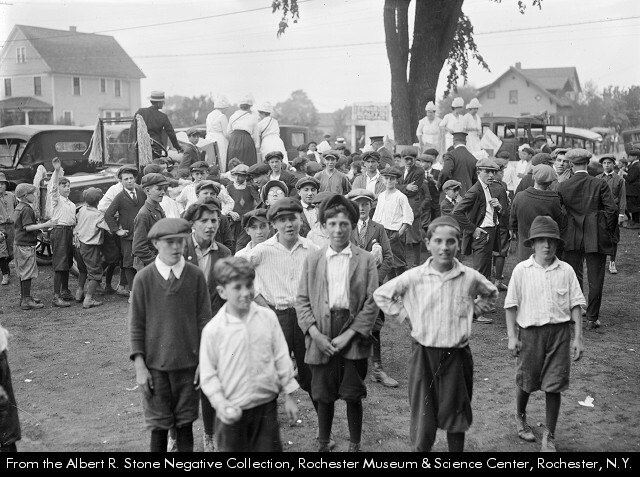 In our golden age, just after the turn of the 20th century, Rochester was a lively, robust, sometimes rowdy place. It was dense, urbane, and magnificent. Milk Week at Baseball Park, 1922. 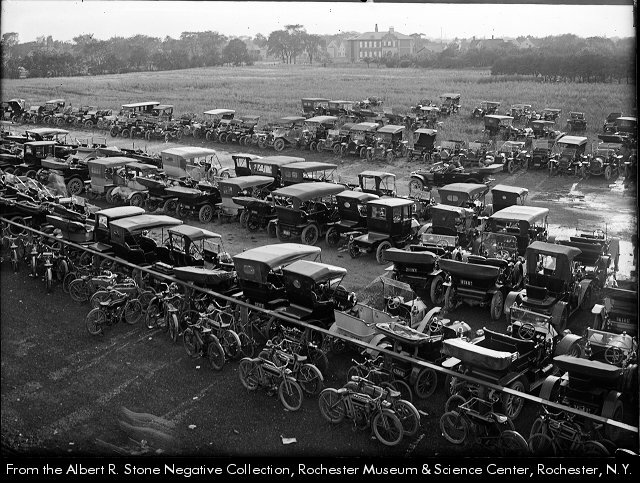 And then, in the 1930s, the city began its dreadful transition for the sake of the car. Due to a depression and a world war, this happened slowly at first, as Silver Stadium shows us. But after the war, the atomization of our urbanism picked up speed. By the 1990s, when our baseball was moved to Frontier Field, the city had pretty much emptied out, and our cars were our regional deities. In the end, we still have the extraordinary stories of this place, the extraordinary images, the sure knowledge that once the urbanism here was spectacular, and that baseball tells a part of that story, those stories. We still have baseball in the city, and so there must be some hope for our urban future. Reader David Steele has asked what the street side of the Main Street bridge was like. Reader Jason Haremza told him: just like any other street, really. You’d never know the river was there. Herewith, proof. 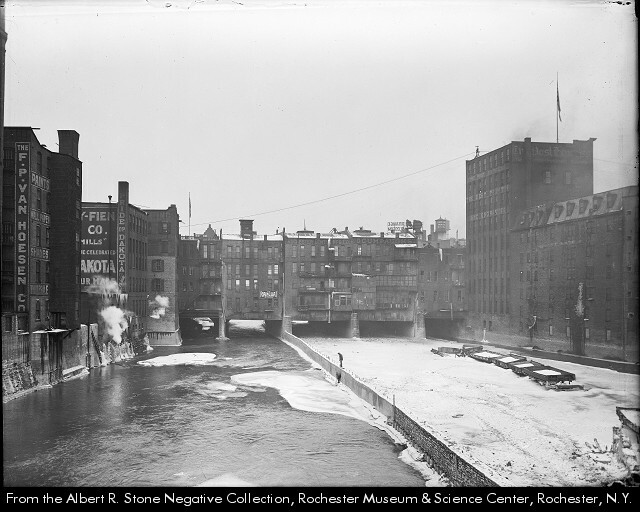 Here’s the bridge from the south, looking downriver, in 1919, on a day when the river was very high. 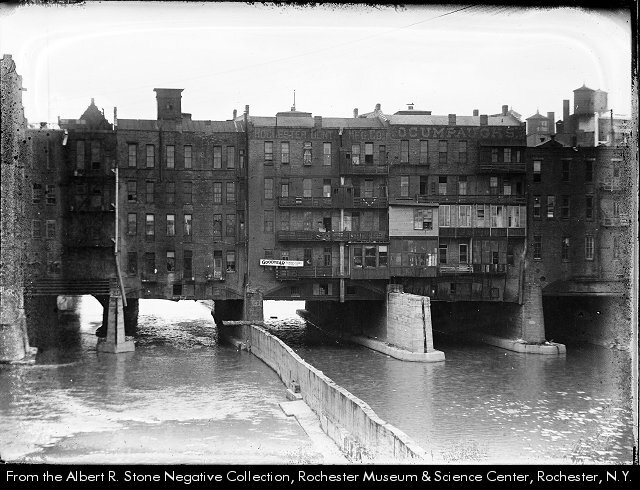 (This was after the city deepened the river under the bridge in 1916, because of a flood in 1915). 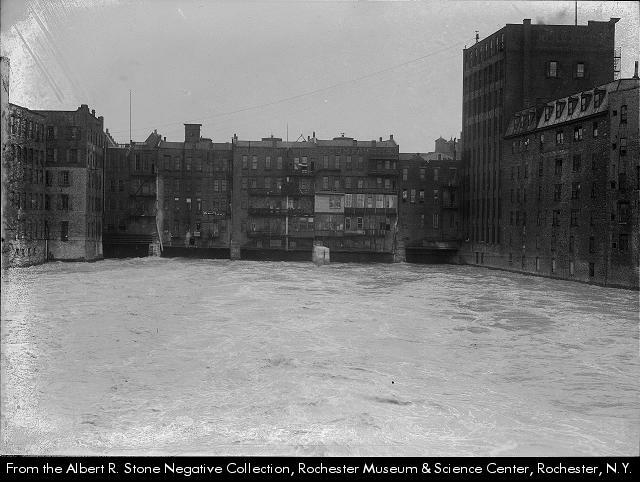 Here’s a similar view, a bit closer, from around 1920. And here’s a similar view but closer still, from 1922. Can you make out the name on the upper right of the right hand building? Ocumpaugh’s. Remember that – here’s the front on Main. 51 to 55 South Main, 1922. These shops and offices comprise the Ocumpaugh property. The pedestrians are all on the bridge. Okay, so what did the street side of the bridge really look like? One more image tells the tale. 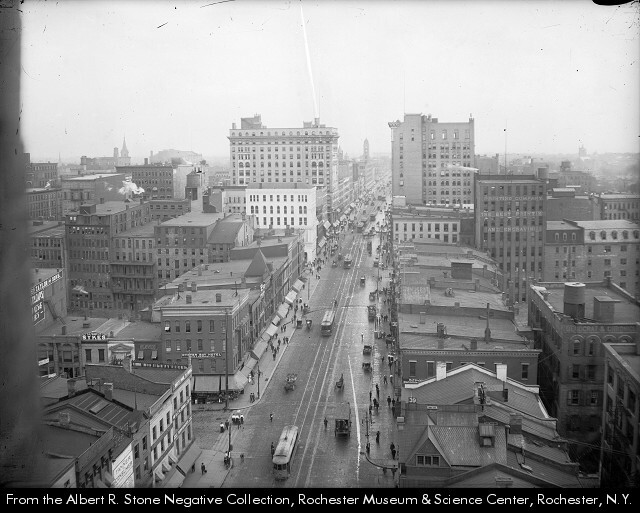 Main Street, looking east across the river, in about 1912. The streetcar in the middle of the image is almost exactly in the middle of the river. In truth, it would have been a nicer bit of the city if there was a little porchlet or terrace out on each side of the river, providing passers-by with a little vista up and down the river. The Ponte Vecchio does have that lovely colonnade on each side. But it was pretty nice, anyway. Streetcar buffs – note the headways on the westbound side of the street. What do you figure? 20 seconds, maybe?